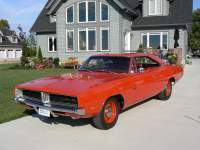 DodgeCharger.com Forum > Discussion Boards > Aero Cars (Moderators: Chryco Psycho, hemigeno, firefighter3931, Charger-Bodie) > Is This Superbird Known? I was looking through a nearly 40 year old note book of mine from back when I was actively looking for what would be known as "barn finds" today. I came across a note and a VIN for a Superbird. Wondered if this car is known or on anyone's radar. VIN is RM23V0A168749. I may have written the VIN down wrong, or possibly a mis-stamp, as my only notes state 440 4BBL, 4SPD, 32000 miles. Which would make it RM23U0A168749. The original colour was yellow I believe, although it was hard to tell and I never saw the data plate (hood was locked). I do not even recall where it was exactly, but probably was in Michigan or Eastern Ontario as that seems to be where I was searching at the time. Sorry, no photos. I had completely forgot about this until I looked through my old notes. You know you are vintage when someone says, "Back in the day", and you can dispute their facts. Re: Is This Superbird Known? Yes, that is it in all it's glory. I thought it was yellow, not orange, but it was nearly 40 years ago and inside a dark garage when I saw it. I did not find that link with initial google searches. Someone drew it to my attention after I posted. That photo looks to be about the same time period I saw it, however the news letter is dated 2010, but not clear on the date of the photo.